Certiport, Microsoft and Netlearn are offering an opportunity for learners who are Microsoft Office whizzes to represent South Africa at the Certiport Office Specialist World Championship. This global competition tests students' skills on Microsoft Office applications. The learners with the highest exam scores and the lowest exam-taking times in the national competition will be invited to represent their country and compete at the World Championships. When and where do the World Championships take place? New York, USA between 28 and 31 July 2019. The learners who represent South Africa at the World Championships stand to win a range of prizes. 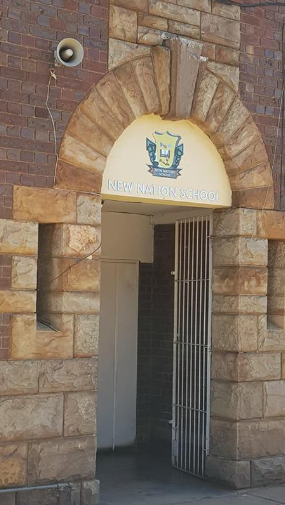 In October 2018, the old Gauteng Online computer room at New Nation School in Vrededorp, Gauteng was equipped with Windows 10 laptops by Microsoft Philanthropies as part of a larger programme of support provided to the school by the Trevor Noah Foundation. SchoolNet SA has conducted the 'Change Leadership for Technology Integration' course for school leaders and the 'Microsoft in the Education' course for educators at the school and has also provided some onsite coaching and support. Whilst the school has only had a well-equipped computer room for two terms, we've been pleased to see the progress that has been made to date. This blogpost highlights some of the key successes and learnings of the New Nation journey so far. The delay in installing the computer equipment at New Nations proved to be a blessing in disguise. Through the Change Leadership course, school leaders had time to think about the changes that technology could bring to their school and how they would like to use the equipment as a catalyst for change. An ICT committee was appointed and a school ICT policy was drawn up prior to any devices being installed so that by the time the equipment arrived, teachers and learners knew what to expect and what the systems were for using the equipment. Learners were required to sign an acceptable use policy before being allowed to use the computers - establishing good norms for the equipment from the outset. When a school has a well-equipped computer room, there is a temptation to use it to use it to offer Computer Applications Technology as a subject. Whilst CAT teaches valuable skills to learners who take the subject, it can mean that other learners don't get a chance to use the computers for other subjects, and learners in lower grades don't have a chance to build computer literacy skills. At New Nation, teachers were consulted about who wanted to use the computers for subject teaching and a timetable was drawn up to give teachers a regular slot in a week. Whilst learners may not use the computer room in every subject, once or twice a week learners will go to the lab to do research or to work on documents for one of their subjects. This is a great start, and hopefully as more teachers build confidence and skills they will ask for slots on the timetable for their subjects. The New Nation School computer lab timetable ensures that teachers can plan their use of the computers in advance, but the lab is not timetabled for use every period. This means that when a teacher who does not have a regular slot wants to get his class to do an interactive quiz or wants to show a subject-related video he or she has been able to make arrangements to take his or her class to the lab. This arrangement helps to ensure that more teachers and subjects can make use of the lab - even if only occasionally. The New Nation teachers had a go at doing the Hour of Code and loved it... but few of the teachers felt confident to run the activity for learners. 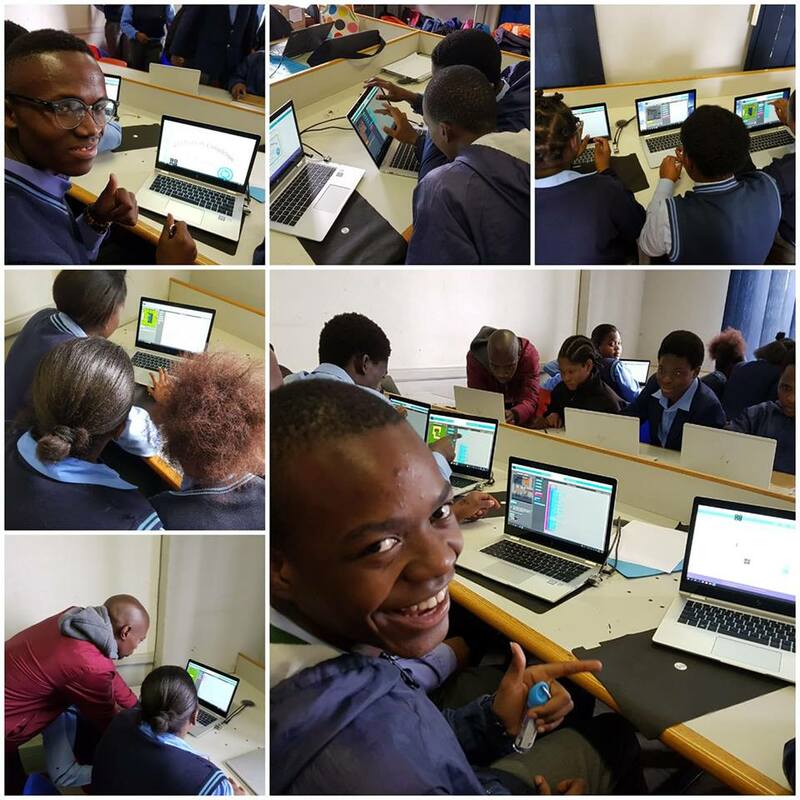 At one of the coaching sessions, the SchoolNet SA coach helped co-teach a lesson with the teacher - which basically involved showing learners how to access the Minecraft themed tutorials and walking the learners through the first one or two puzzles. After a very brief introduction, learners were largely able to work by themselves, with some learners flying through the full challenge at record speed. After this successful session the Grade 12 First Additional Language teacher said he now felt confident enough to run a session on his own for his other classes and had realized that he does not need to be an expert at everything in the computer room - he just needs to provide the learners with an opportunity to develop their own skills. When teachers have free periods at New Nation School, they can often be found in the computer room, working on one of the laptops. Sometimes, even when a class is in session, teachers will find a free computer and will carry on with their own work. It has been a joy to see teachers using Excel to capture their marks, Word to create worksheets and PowerPoint to prepare presentations. Teachers are able to informally help one another and the computer room coordinator assists if she is around, but most teachers are finding that as they use the computers more, their skills improve and they need to ask for help less often. We were excited when we heard that after one teacher used Socrative other teachers asked their colleague to show them how to make their own interactive quiz. This shows that teachers are willing to learn from one another, to seek support and to try new tools. Once teachers had access to school O365 accounts teachers were able to access their accounts from any device. This has been a big help as teachers can now work at any computer in the lab, or from their phones or personal computers at home.This has reduced the risk of viruses from teachers saving their files to flash drives and has also meant that sensitive documents like tests or mark-sheets are not being saved on the hard drives of laptops - where learners using the devices can access them. "My class made a chance to do research about the career that we want to be. I also got a chance to do research about mine. Also touching that laptop even though it was my first time its made me so happy." "Today I had a nice or enjoyable experience. We went to the computer lab for the first time since grade 8. Yooo! I really enjoyed the computers with touch screens and that was my first time using them. I always hear about it but never experience it. We searched for our future careers and heard some advice from those people who are successful in those careers"
Whilst we are excited by the progress made by teachers at New Nation School to integrate some digital tools into their lessons, we'd like to see learners having more access to the computers and more opportunities to build their digital skills. In the new term we hope to see learners getting O365 accounts which will enable them to save their work in their own space on the cloud and we also hope to encourage learners to complete the Digital Literacy Curriculum to further boost their skills. In the first term of 2018, teachers from New Nation School in Vrededorp, Gauteng, enjoyed five afternoon workshop sessions on using a range of digital tools in the classroom. These workshops were sponsored by Microsoft Philanthropies in order to help staff to use technology as a catalyst for change at a school that largely provides education to orphans and vulnerable children. During the first workshop, teachers learnt about the Hour of Code and worked their way through the Minecraft themed tutorials themselves. They discussed the importance of exposing youth to basic coding and some of the skills that this can develop. Teachers really enjoyed this activity and a number of teachers have since run sessions for their learners between the end of exams and school closing for the holidays. In the second workshop, teachers completed a Socrative Space Race quiz and were shown how to set up their own online quizzes for when they take learners to the computer room. In addition to enjoying experiencing their own Space Race as participants, it was pleasing to hear that after this workshop a number of teachers used the tool in the lab and that learners enjoyed testing their knowledge in an engaging way. In the same workshop, teachers were introduced to the Computer Olympiad Talent Search computational thinking skills materials. Teachers had great fun working through some of the online puzzles and also learnt more about computational thinking and how important it is to develop these skills. 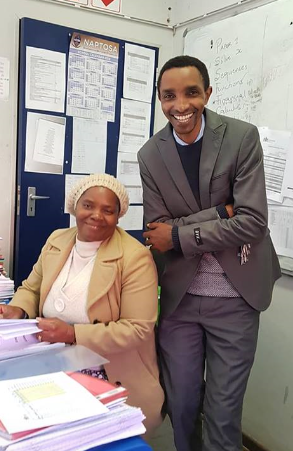 We hope that New Nation teachers will go on to use the online past papers with learners, and to enter the most promising candidates into the Computer Olympiad Talent Search. Each New Nation School teacher was given a Microsoft Office 365 account which comes with a personalized email address that includes the school's name. Not only do these accounts help to professionalize email communication with colleagues and parents, they also come with OneDrive storage capacity and access to a range of online Microsoft tools including Sway and OneNote. In this workshop teachers were shown how to access their accounts, they sent and received email and compared working in the cloud to working on the offline Microsoft software. 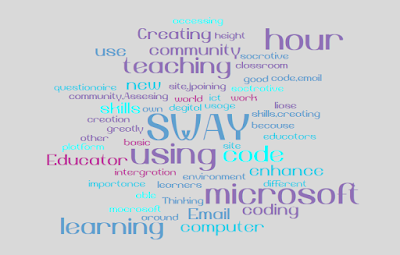 Sway is an O365 tool that lets one create great presentations that look good on any device, that are easy to share, and that can be created collaboratively. 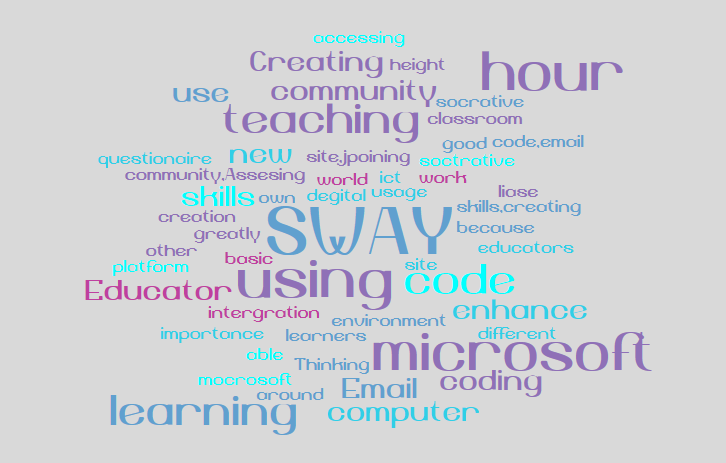 In the fourth workshop, teachers were introduced to Sway and were given some time to create a Sway introducing themselves. Whilst teachers did not have ready access to their own photos on the shared devices, the lesson provided a good opportunity to talk about saving one’s own documents to the cloud. Teachers also discovered that they could use the cameras built into the laptops to take pictures of themselves. In the final workshop teachers joined the Microsoft Educator Community and were given a tour of some of the resources available in this portal. After completing their online profiles, teachers were given a code to earn a badge indicating that they had had introductory O365 training. We discussed how Skype in the Classroom could be a valuable tool for bringing guest speakers into the classroom and allowing learners to collaborate with classes from around the world. Ms Kim Ranwell of Herbert Hurd Primary School in Port Elizabeth, recently placed third in the 19th National Teaching Awards 'Excellence in Technology-Enhanced Teaching and Learning' category. Along with teachers who placed first and second, Ranwell won a SchoolNet SA SACE accredited professional development course of her choice for herself and her colleagues as well as a sponsorship to attend the SchoolNet SA Digital Learning Conference, taking place in North West province in June 2019. Technology permeates every learning area in Ms Ranwell’s school; the school insists on having it included as a lesson in each subject taught. 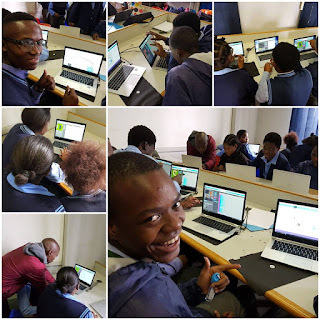 Learners are also given an opportunity to independently demonstrate their understanding of the various ICT applications by creating various multimedia content, which they then present to the class. Ms Ranwell not only champions the learners’ cause but has been instrumental in empowering her fellow teachers to effectively use the technology that is at their disposal. Mindful of people’s natural resistance to change, she uses her dedication and absolute passion she has for technology to convince them of its benefits. “Everything that I do comes out of the belief that technology does enhance the children’s learning and can improve our teaching,” she says. According to Ms Ranwell, staying abreast of technological developments in one’s area of interest and the willingness to constantly redefine oneself is critical in today’s education system. She advises other teachers to move with the times and try new ways of doing things. “You cannot do things the way they’ve always been done, you have to find out what works best for the learners you currently have in your class because they’re very different to learners we’ve ever had before,” she concludes. “SchoolNet SA is especially proud to support the Excellence in Technology Enhanced Teaching and Learning category of the NTAs. As an organisation, we believe in improving existing pedagogies by providing innovative classroom activities that harness new technologies, that promote higher order thinking skills and ignite a spirit of enquiry among learners. 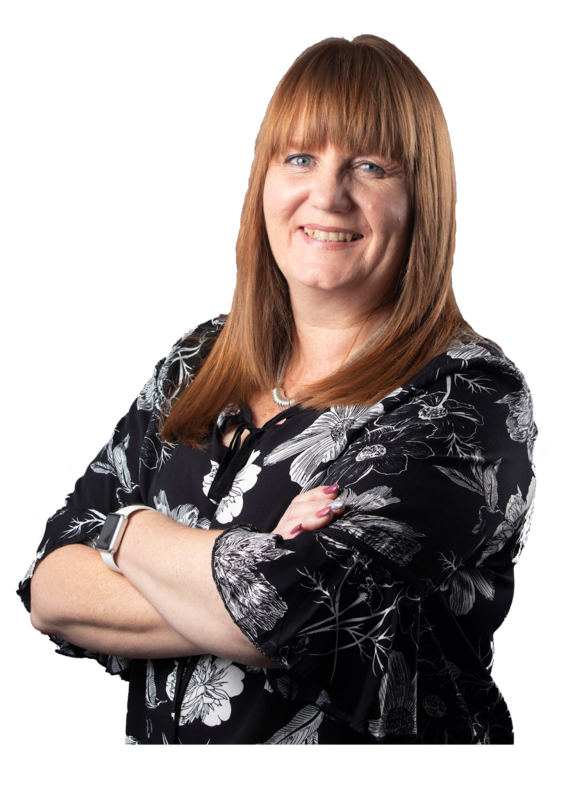 The teachers who won the Excellence in Technology Enhanced Teaching and Learning Category are teachers who have demonstrated that they have embraced digital learning and are using this to the benefit of their learners,” says SchoolNet Executive Director, Janet Thomson. On Saturday 30 March 2018 Microsoft and HP will be hosting Teaching Teachers workshops - one in Pretoria and one in Edenvale. The workshops will be presented by SchoolNet SA facilitators and will focus on OneNote and how it can be used as an educational tool and features of PowerPoint that can be used to flip your classroom. The workshops are free to teachers, but places are limited and offered on a first-come-first-served basis. Teachers who would like to attend one of the workshops will need to register in advance by clicking on the link for the session and venue where they would like to attend. No walk-ins will be accommodated who have not pre-registered. Please bring along your own device so that you can participate in this hands-on workshop. You will also require a Microsoft or O365 account - so please register for one prior to the workshop if you don't already have one here. We look forward to seeing you at one of these hands-on professional development sessions. Why not invite a teacher colleague and make a morning of it?